The Ronald McDonald House Charities of Alabama is excited to announce our Make Eating Matter campaign starting July 12th. RMHCA is partnering with some of your favorite restaurants in Birmingham, including California Pizza Kitchen, Your Pie and Chipotle. In attempts to raise money for our house, RMHCA will be at different restaurants weekly. A percentage of the proceeds earned will go towards keeping our doors open to the families that need us most. 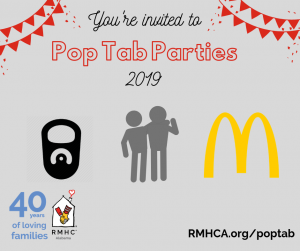 As RMHCA goes through our expansion period, we need all the help and support from the Birmingham community that we can get. 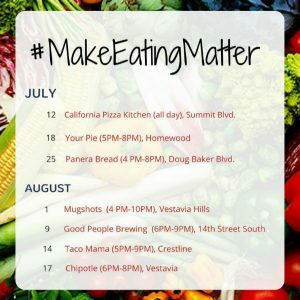 Join us in keeping families close by supporting the Make Eating Matter campaign! We will be posting daily updates and reminders on Facebook, Instagram and Twitter.